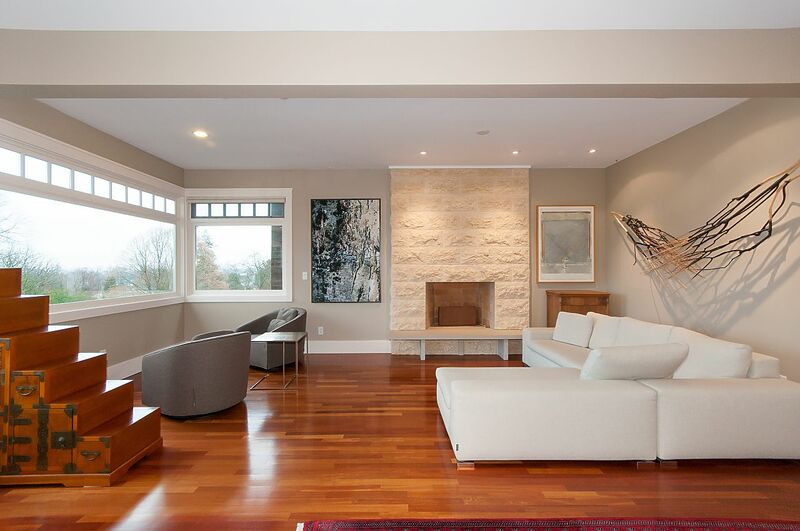 Elegant Point Grey home with stunning water, city, and mountain views. Built in 2003 on a private and quiet 33x122 corner lot surrounded by beautifully manicured, mature landscaping. Entertaining style floor plan with Brazilian Cherry hardwood floors, gas/wood fireplace in the living room, large chef's kitchen with Wolfe gas range, island, stainless steel appliances, and Travertine counters adjacent to a sizeable family room and French doors leading to a walk out South facing backyard. Expansive windows in the living room to appreciate the impressive views. 3 bedrooms up, including Master bedroom with built-in cabinets and drawers, 5 piece ensuite with soaker tub, South facing deck off the back 2 bedrooms, and a ductless A/C / heat pump. Spacious and bright lower level with concrete floors, bedroom, full bathroom, gas/wood burning fireplace, and French doors at grade level out to a front patio area making it an easy suite conversion. Sizeable laundry room off studio. An abundance of custom built-ins throughout offering lots of storage space. Thoughtfully designed yard with 5 outdoor seating areas and irrigation. 2 car detached garage. Easy access to transit, airport, downtown, UBC, 10th Ave and Broadway shops. Lord Byng catchment and close to WPG academy. Truly a pleasure to show.